The Lexus cars to be marked up are mainly the 3.5L-plus models. The 2008 Lexus ES 350, of the lowest rise rate, has its price marked up by 57,000 yuan ($8,340USD) to 529,000 yuan ($77,406USD). 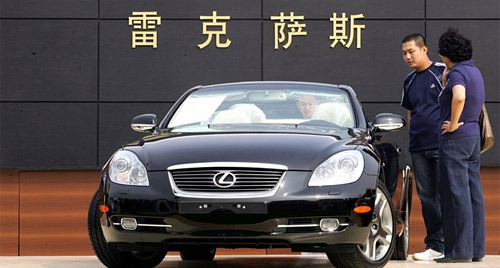 The 2008 Lexus LS600hL, a hybrid model, has 513,000 yuan ($75,065USD) added to its current price of 1.598 million yuan ($233,830). The prices of the Lexus IS-Series models have not risen this time. The Lexus models will sell at new prices when the policy of new consumption taxes on imported cars is implemented later this year. The policy says the tax rate of vehicles with displacement of 3.0L to 4.0L will increase to 25% from 15%; the tax rate of 4.0L and above vehicles will rise to 40% from the current 20%. I definitely had a bout of nausea while converting the numbers to US funds, though the prices were hardly reasonable to begin with. Of course, it makes perfect sense in the eyes of the government officials as Consumers will be more likely to buy Chinese. Not only that, if foreign car manufacturers still want to tap into the world’s most promising market, they’ll have to build local factories.